Fox has set Sept. 13th for its "Southern-style send-off" of King of the Hill, which endured for 13 seasons. The series finale, at 7 p.m. (central), will be back-to-back new episodes titled "The Boy Can't Help It" and "The Honeymooners." 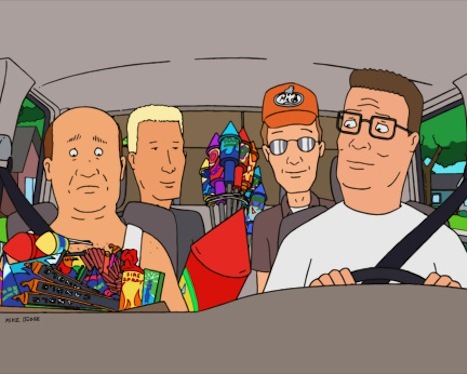 Series creator Mike Judge, who now headquarters in Austin, based the series on his formative years in Garland, with fictional Arlen, TX standing in. He also is the voice of family patriarch Hank Hill, who shared countless six-packs with beer-loving buddies Dale, Bill and the incoherent Boomhauer, also voiced by Judge. Guest voices over the years have included Johnny Depp, Meryl Streep, Brad Pitt, Chris Rock, Sally Field, Rene Zellwegger, Ben Stiller, Jennifer Aniston, Matthew McConaughey and The Dixie Chicks. In later years, Tom Petty became the recurring voice of Lucky, who married Hank's niece, Luanne. ***NBC will get into the ring on Saturday, Aug. 29th with a one-hour package of highlights from Wrestlemania 25. The April 5th event drew 72,000 fans to Houston's Reliant Stadium, where the main event of The Undertaker vs. Shawn Michaels "tore the house down," according to NBC. Mickey Rourke, an Oscar nominee for The Wrestler, also dropped in "interjected himself into a match." Musical guests include AC/DC, Korn and The Hives.